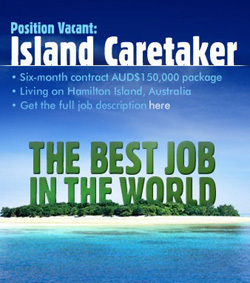 I have found the perfect telecommuting job for someone who can pick up and take a 6 month “vacation.” Well, you get paid – but it really is more like an extended vacation on an island paradise. Get this – you’ll have to live on an island paradise with sandy white beaches and blue skies for 6 months, rent free, in a 3-bedroom villa that’s complete with a pool of course. You’ll really only be working approximately 12 hours per month (feeding fish and collecting the island’s mail) but you’ll also be expected to prepare a blog, a photo diary, and make video updates. Hamilton Island in Australia’s Whitsunday Islands. Promote tourism to the island. Nothing formal, but should love to swim, snorkel, dive, and sail. They’ll pick list of 10 candidates from all of the online video applications and one wildcard to visit the island for a 4-day final interview process. The first day of the new job is slated for July 1, 2009. The competition is pretty stout. According to a Tourism Queensland news post today, they’ve received more than 200,000 prospective applicants in 24 hours. What a brilliant tourism campaign!